Its a breathtaking accomplishment. As I came through the back of Keith’s suburban bungalow, I spotted the attraction in the backyard. Behold twelve hundred square feet of ice, six inches thick, rimmed with plywood boards. 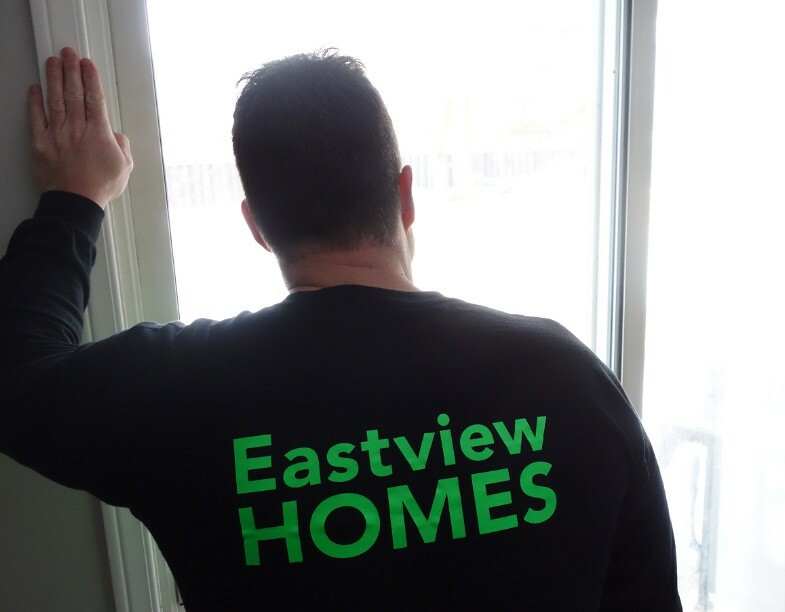 Proud of his accomplishment, Keith boasted “You’ve got to come back in the evening when its all lit up and we have all the neighbour kids over playing hockey, and free skating”. He pointed out the mercury vapour lamps (same as in the local arena but smaller) that he has affixed to poles on the perimeter. 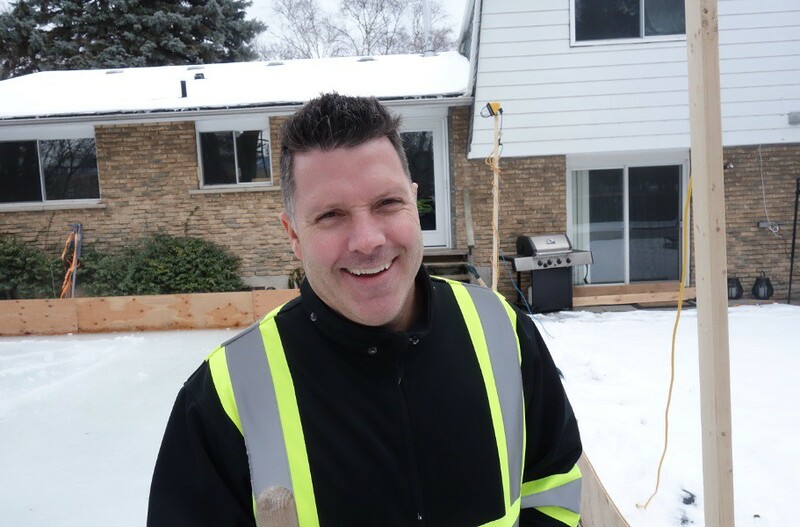 Keith’s backyard is perfect because the contractor made it that way; the area was specially leveled and landscaped and all the small trees were removed when he first bought the property a few years ago. The rink boards were cut last year. They’re 4×8 plywood sheets ripped lengthwise into eight foot long boards. Keith could have used cheaper materials, particle board OSB, but he had some 3/4 inch plywood left over from a job and he knew the ice rink was a project he’d be repeating for years to come. The braces, two on each board, are more perishable; they’re made from salvage cut from old pallets and other bits of scrap wood. Keith learned last year to run the hydro for the lights first- the power cords are safe from sharp skates under snow and ice, right on the ground. Keith also evolved a sound system this winter; he has two small stereo speakers plugged into a radio in the kitchen. 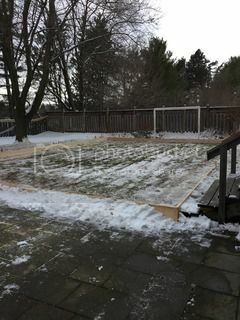 TIMELINE of a backyard ice rink – first you clear the area and run power for lights and put up the boards. “I leave the grass long in the fall in case we get a good snowfall, and I can do the snow pack method to save the liner.’ There are two methods of making a liner. First, if there’s a lot of snow the you can use the snow pack method, which involves tramping down the snow with your boots until its hard packed and will hold the water. Or you can buy some very large sheets of thin plastic and fashion your own pool liner or in this case a ‘rink liner’. Painters’ drop sheets are too thin and the wrong size. They won’t work unless you can figure out how to bind them together with duct tape to create a watertight surface. The thicker the plastic, the easier the tape applies, right up until the plastic is too thick. The hardest part for Keith this year was just waiting for the ground to freeze as the weather by the lake is so variable. It wasn’t until late December before Keith had the courage to call the water truck service. He ordered three thousand gallons of water to make a six inch slab, and if readers are seeking to replicate this rink they can use this handy pool volume calculator to calculate their own needs. Keith learned last year that six inches is the ideal (or most efficient) ice thickness to avoid pressure cracks and create an immovable solid ice mass. Safety is always top-of-mind when making a kid friendly backyard attraction. Keith has evolved a more kid-friendly ice rink this year even though he claims his rink is entirely injury free. Despite the flawless safety record, or maybe to help ensure it continues, the building contractor took the time to eliminate protruding stakes and sharp edges that can cause more harm to anyone slipping, losing their balance and falling. 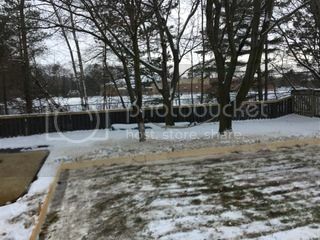 The wooden perimeter rises about a foot above the ice surface and this year the corners and top edges are smoother and all the stakes have been hammered down flush with the top of the boards. And finally, lets not forget, ice rink makers have to think ahead to the spring melt. Where is all that water going to go? Keith runs a line to his neighbour’s in-ground swimming pool, which is right next door and downhill. He made a deal with this friend after concerns were raised that the melting ice rink could otherwise flood both their basements. 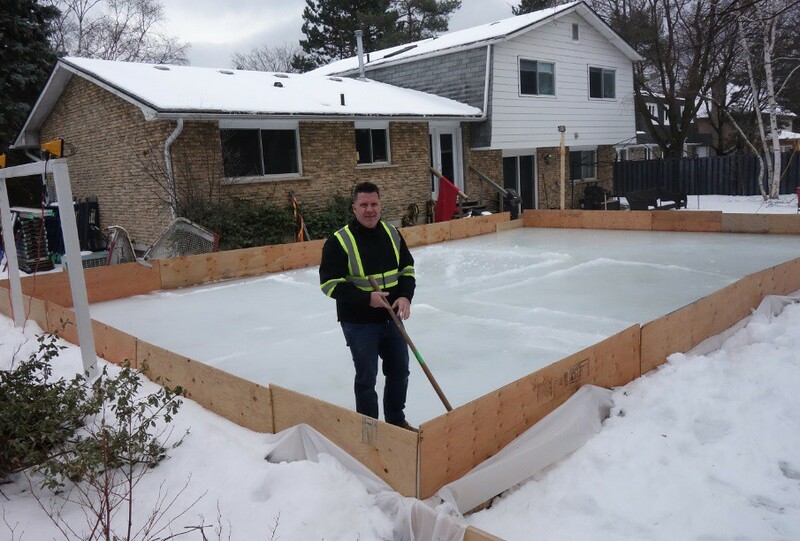 Keith Travers – DIY Ice Rink in backyard. Does having a property with a big backyard improve the quality of life for a young family in the summer and in wintertime? Absolutely. Previous post: 10 Unforgettable Fly Fishing Locations in the U.S.
Next post: Kids Love Riding Horses, and Dads Should Too!